Armenia Fund USA hasn't added a story. Support OUR VILLAGE campaign by donating here! Armenia Fund USA is a non-profit organization dedicated to economic, humanitarian, and infrastructure development in Armenia. 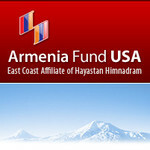 Armenia Fund USA hasn't posted any updates yet. Armenia Fund USA is managing the funds for this campaign.